There are so many old and significant stone bridges in the region of Epirus. Most of them are built between centuries of 17th and 19th. Though nowadays many of them are still stable for use, most of them are forgotten and used only by few people. All of them own a great history and legends, they all are works of art and are worth visiting if you drive throughout Epirus. 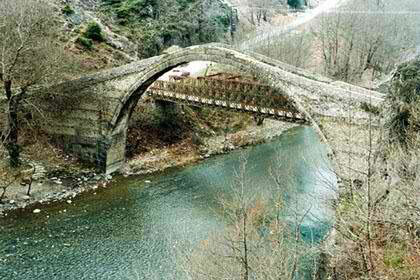 Many old stone bridges you can see expecially in prefecture of Ioannina, like Kokori and Misiou bridges. 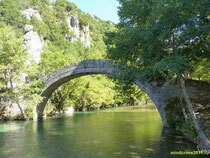 The most wide stone bridge of Epirus is Plaka’s bridge which is very significant. Arachthos river was always a great obstacle for the villagers of Tzoumerka mountain and their flocks on their way back and forth to the plains of Arta and Preveza. Many men and animals were lost in the rapid waters of Arachthos river exiting from the narrow gorge, at the place named Plaka Raftaneon. In 1860 the waters moved a rock supporting of the old bridge and swept it off; master Ghiorghis from Konitsa built a new one in 1863 that collapsed on the inauguration day, in full view of the celebrating villagers. After that, technician Kostas Bekas from Pramanda undertook rebuilding it on his own design and he managed to finish his work on the bridge in three years. It is the widest stone-made bridge of Epirus and probably of Greece, standing proudly and the hardest one in construction. With its impressive 40-meters-wide arch it stands some 18 to 20 meters above the waters of Arachthos river. It has also two small auxiliary 6-meters-wide arches on its two sides. It is admired even today as a work of exceptional art. The Polytechnic University of Athens has studied the bridge and confirmed its stability. Today the road passes over a modern bridge, leaving the old one alone but still proudly standing. 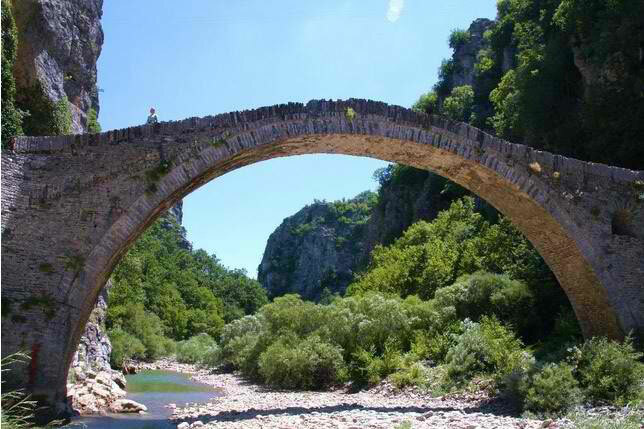 One of amazing bridges at Zagori, near Kipi village, is the bridge of Plakidas or Kalogheriko. Once it was wooden, but it was changed to a stone bridge in 1814 by a monk named Seraphim, living in Vitsa monastery, who spend 20,000 piastres for this purpose; that's why the name Kalogheriko (=monk's). The other name, Plakidas' bridge, comes from Alexis Plakidas and his brother who restored it in 1865. In central Zagori, near Koukouli village, 39km from Ioannina, at Voidomatis river, Noutsos Kondodimos from Vradeto made one more of the 47 stone bridges of Zagori – Kokorou bridge. On those days, donating money for a bridge was a "great benefaction". Near Arta, the river flowing in the plain is quite wide. In order to bridge it, 4 adjacent arches were necessary. The first of them is higher, facilitating boats to pass. The main material was slate, found in the area, and the binding material was a mixture of ceramic slivers, slaked lime, pumice-stone, earth, water and straw. Sometimes raw wool was added for better results. Kostis Palamas, a great Greek poet, said: "Arta's bridge is a folk masterpiece, like the verses of Homer's rhapsodies, and stays there for being exploited by poetry and music, as long as they exist." Arta's bridge is not the most beautiful of the kind, but the most famous. 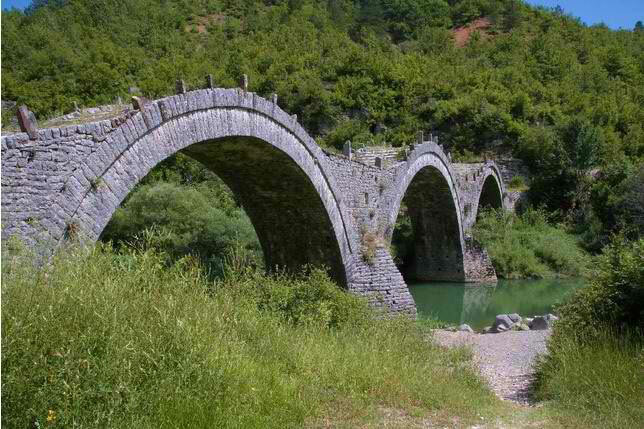 It is the most well-known multi-arch bridge over Arachthos river and one of the best-preserved monuments of Arta. Elegant, imposing, standing over the river, with the arches secured on thick, steady pedestals. Its whole construction is admirable. It’s total length reaches 145m and its width 3.75m. According to Plinius, the bridge has roots in the Classic or Hellenistic period. A legent dates the present construction back to 1602-1606 and talks about a peddler from Arta, named Yannis Diakoyiannis, who financed the works. Others mention the name Nikolas and the year 1609. On the way from Ioannina to Konitsa, near Kleidonia village, Voidomatis river, flowing to join Aoos river, comes out from its wild verdant gorge to enter Konitsa plain. Just before the modern bridge, to the left, there is a road leading to a hotel. Continuing on the dirt road to the left we will see an old stone bridge among plane trees. The scenery is gorgeous. On the opposite bank, the Forestry of Konitsa has created a recreation area with wooden tables, benches, children's playground and barbecues for free use. The place is under the plane trees and by the river. Voidomatis' waters are crystal clear, as being filtrated by the natural rocks, and crystal cold also. However, during summer, some visitors dare to swim in there. Nature's harmony and gurgling waters are really refreshing for the travellers who have to continue their way. There had been some efforts to bridge the river but were unsuccessful, like the one in 1844, when 19,000 piastres were spent. Finally, in 1853 the present beautiful stone bridge was built, paid by Balkiz Hanum, spouse of the Turk Malik-pasha. This arched bridge is a perfect construction. Under the bridge, to the left, there is a stone-paved path leading to the monasteries of the valley. The singularity of the bridge of Konitsa is due to its huge arch and to its place. This one-arched stone bridge, being one of the biggest in Greece, has a height of 20 m and a length of 40 m. It was erected in 1870-71 paid by the banker I. Loulis from Katsanochoria. Some other donators and habitants of Konitsa participated also to the expenses, raised to 120,000 Turkish piastres. Technician was Ziogas Frontzos from the nearby village of Pyrsoghiani. The best place to make a bridge is a narrowing of the river, having also some good rocks. In such a case one and only arch of big radius can cover steadily the distance, avoiding at the same time bigger and more expensive constructions. 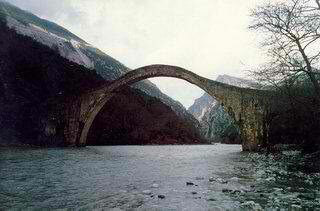 Konitsa’s bridge is such a case. The technician chose the place where Aoos river is squashed by the steep towering Gamila peak and the precipitous slopes of Trapezitsa mountain as the best to build the huge arch. The bridge is really a stunning work of art and beauty, with perfect lining, glorifying the bridging technical tradition of the time. The bridge was restored in 1913, as it was bombed and damaged by the retreating Turkish army. Under the bridge, at the top of the arch, there was a bell hanging. In case of strong wind, the bell was ringing, warning the passengers of the increasing danger. The bell was lost and was replaced in 1975.